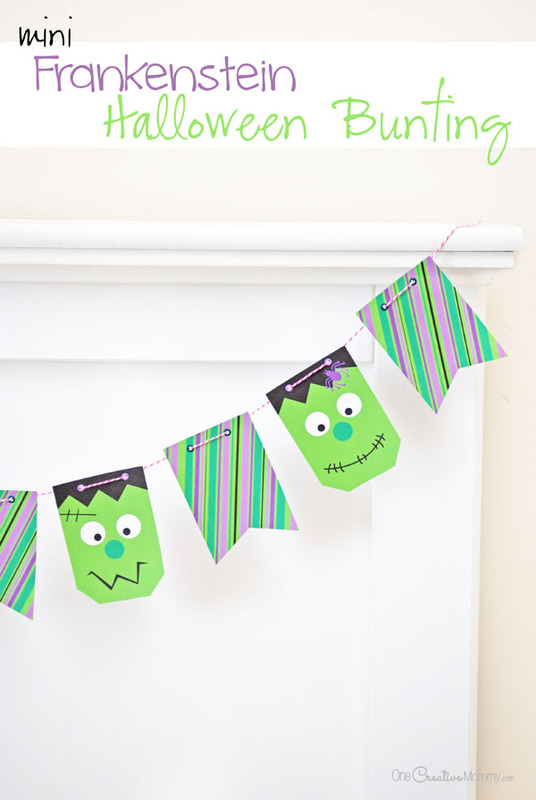 You are here: Home / Blog / This mini Frankenstein Halloween Bunting is a scream! 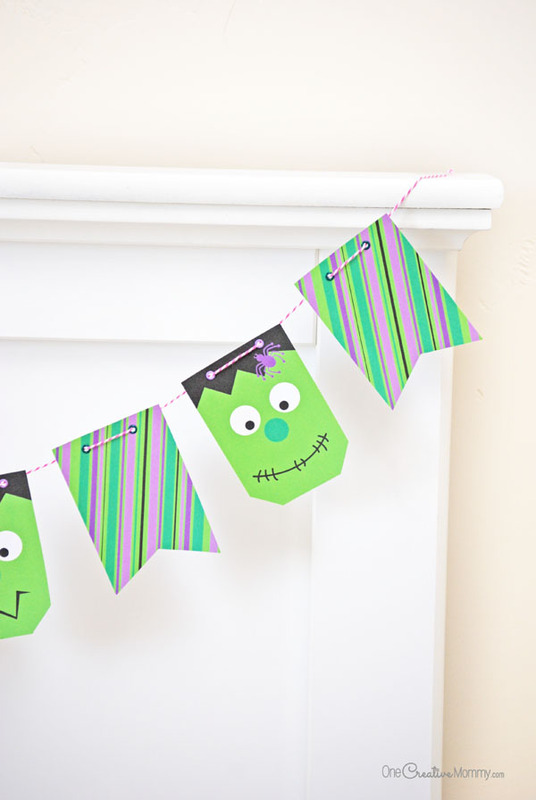 This mini Frankenstein Halloween Bunting is a scream! Happy Spooktastic September! These Halloween decorations are so easy, it’s scary! (Pun intended.) I’m not a fan of the scary version of Frankenstein, but I love the cute version. 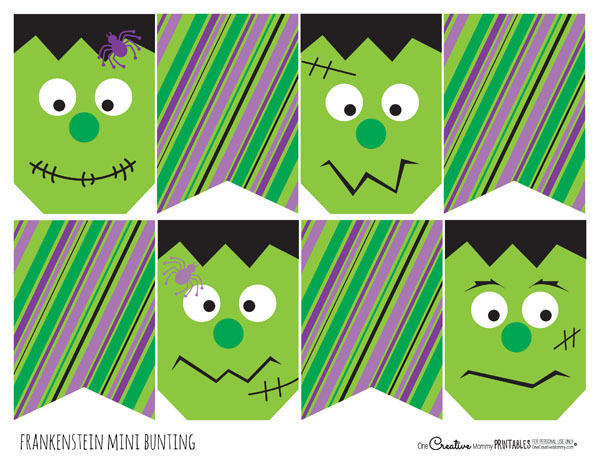 I created some silly-faced monsters to grace this screaming cool mini Frankenstein Halloween bunting! 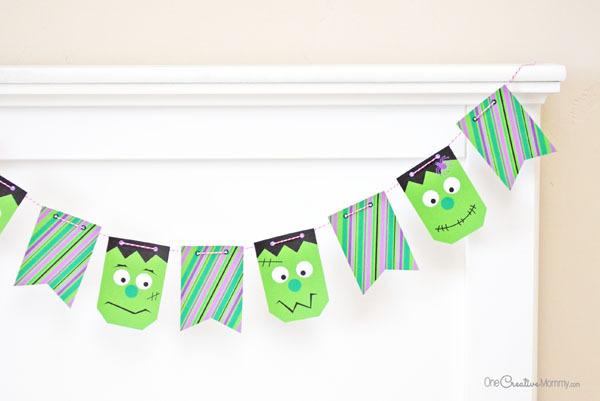 These fun Halloween pennants come with four different Frankenstein faces and four striped pennants. You might even see a couple of spiders creeping in. Each pennant is just under 3″ x 4″. String them up across a bed frame, a mantle or staircase railing, a picture frame, a mirror, or even across your computer screen at work! 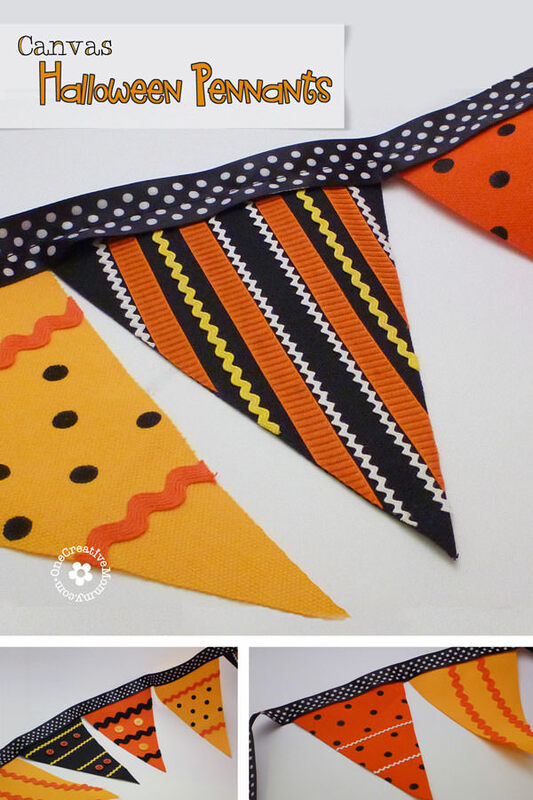 Ready to print this adorable Halloween bunting? Just click on the download button below the image of the printable to open the pdf in a new screen. You can print the pennats from there or save the file to your computer to print later. I can’t believe that Halloween is right around the corner already. Those are such fun printables. Thanks, Vera. Halloween is one of my favorite holidays, so I love to create new things each year. That is just so cute! I love the colors you used in this! Thanks, Ellen. Halloween is such a fun holiday. I love to decorate with the cute colors and cute “scary” stuff. No gory decor for me. Very cute! 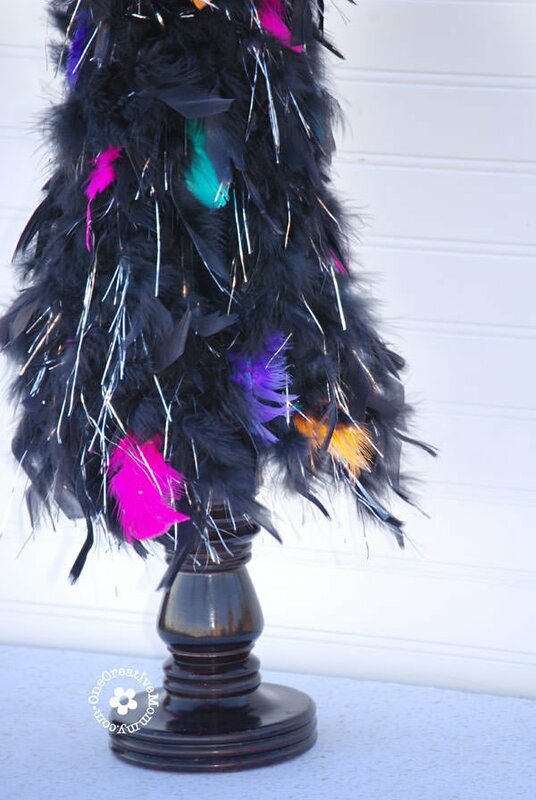 I think this would make a simple, but cute decoration for Halloween. Thanks, Jacqui. It’s always nice to have quick and easy ways to decorate, don’t you think? Thanks, Ashley. It’s my favorite season, too. I love the spirit of Christmas, but the weather and the color of Fall are the best! Oh I can’t wait for Halloween its one of my faves to decorate for! These are adorable Ill be adding these in this year. Thanks, Jenn. I love decorating for Halloween, too. There’s just something about Fall . . .
I’ve never heard of a paper banner being called a bunting before. It is cute and I like how simple it is to do. Thanks, Valmg. I’ve heard them called bunting, pennants, and banners. I can never decide which to call them, so I usually try to include all the names somewhere in my post. That way, whatever anyone calls them, hopefully if someone is searching for it, they can find mine. This would make a great decoration for a child’s Halloween party for his/her friends. 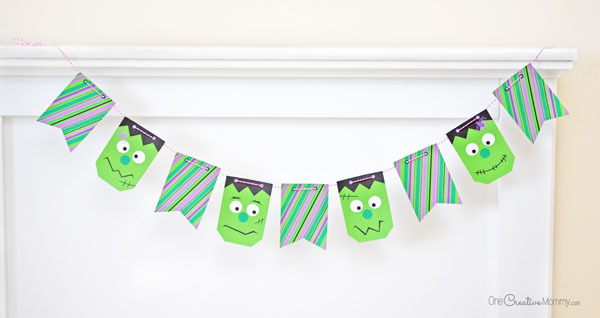 I love the design of the Frankenstein buntings and the pennants too. My cousin would love to have these printables too. 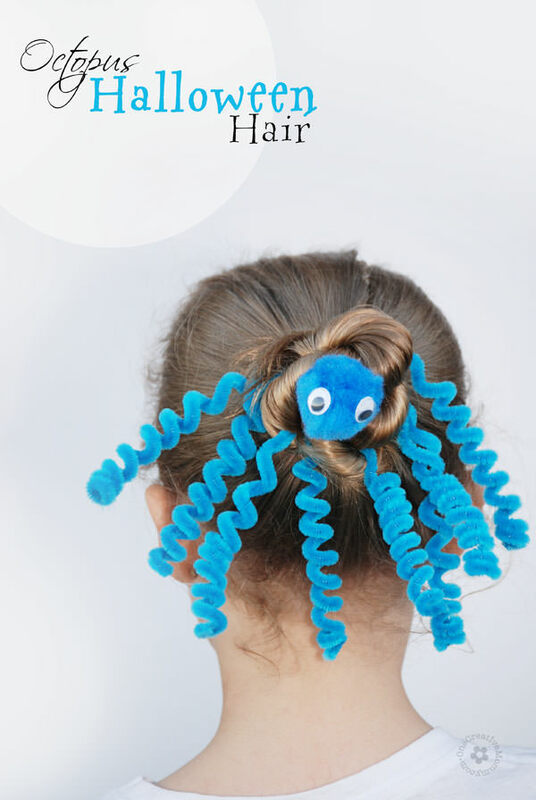 She’s got three cute little daughters that would enjoy decorating for Halloween. Thanks for sharing! Thanks, Annemarie. Decorating for Halloween is so fun, especially with little kids! These are so cute! I absolutely love Halloween too but like you don’t like things to scary. Thanks, Carrie. It’s nice to keep the mood of the home happy, not creepy! Nobody needs nightmares, right? Oh my! 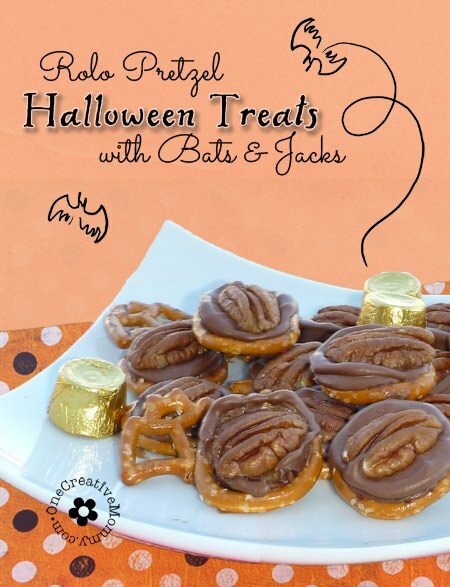 I love all of the fun Halloween decorations and treats you’ve done here, from the banners to the pretzels! The pretzels had me at hello! I bet they taste out of this world! I’m going to try making them, for sure! Halloween is my favorite holiday! I also love buntings. I simply had to pin this post!! I know exactly what I’m doing with my granddaughter next week. We’re getting our craft on! Thanks, Cathi. I hope you and your granddaughter have a great time together! I’m so glad you stopped by, Kyra. And thanks for taking the time to leave such a nice comment!